Our company is one of the leading suppliers and manufacturers of a wide range of Rubber Hand Gloves..ARubber Gloveis a glove made out of natural rubber. 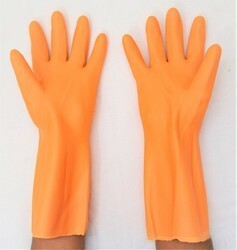 Rubber gloves can be unsupported (rubber only) or supported (rubber coating of textile glove). 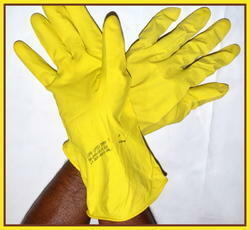 Its primary purpose is protection of the hands while performing tasks involving chemicals. Rubber gloves can be worn during dish washing to protect the hands from detergent and allow the use ofhotter water. Health professionals use medical gloves rather than rubber gloves when performing surgical operations . Rubber gloves are best worn with a skin tight fit which, while still allowing for the hands to breathe, makes it easier to hold objects andmanipulatethem. The palms and fingers usually have araised patternwhich helps provide a good grip whenhandling objects. Wearing gloves protects the hands from harsh detergents and other cleaning products which are used in the home and elsewhere. 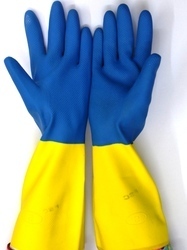 we are able to offer a wide gamut ofHouseHoldGloves. 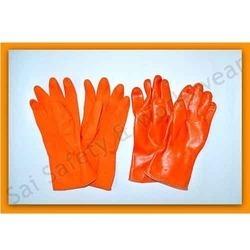 These house hold gloves are designed and manufactured by making use of superior quality latex with inner side unlined /flock lined /spray flock lined. Colors are orange/yellow /pink/red. These are available in Size are S/M/L/XL , Weight-45 to 80 Grms. 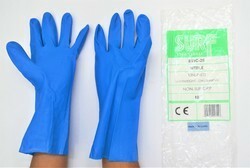 Our product range comprises of anti-acid,anti-alkali rubber hand gloves. We are engaged in manufacturing best-in-class Acid Resistant Gloves to our clients at leading industry prices. 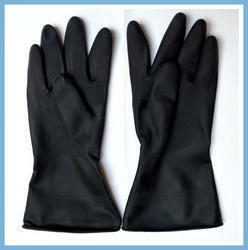 These gloves are widely demanded for their high quality and long service. They are quality checked various times to ensure high quality product is delivered to the customers. 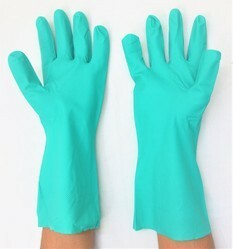 Industrial Rubber Gloves are Manufactured from High Quality Natural Rubber latex. Made For heavy duty purpose, they are ideal for all tough cleaning jobs in the harsh environments. USAGE AND CARE : After use, wash external surface with soap water and let air dry. Uses : , Agricultural , Engineering and workshop cleaning ,heavy equipment maintenance and general industrial cleaning. Heavy Industrial flocklined gloves. 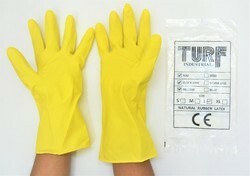 Flocklined Industrial Rubber Gloves are Manufactured from High Quality Natural Rubber latex. Made For heavy duty purpose, they are ideal for all tough cleaning jobs in the harsh environments. Heavy equipment maintenance and general industrial cleaning. NeoLatex Glove Is Made From High Grade Polychloroprene Latex Offering Excellent Protection Against Acids , Solvents, Oils And Grease, Abrasion, Tear, Cuts, And Punctures. All Gloves Are Silicone Free. 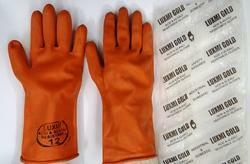 These rubber hand gloves can be used as diluted acid/alkali proof gloves and for general purpose. Household, Industry/Material Handling/Assembly, Construction/Heavy Duty Work, Automotive Industry, Marine Industry, Oil and Petrochemical Industry Cold Resistant/Heat Preservation, Alkali Resistant, Oil Resistant. Silicones, also known as polysiloxanes, are polymers that include any inert, synthetic compound made up of repeating units of siloxane, which is a chain of alternating silicon atoms and oxygen atoms, combined with carbon, hydrogen, and sometimes other elements. They are typically heat-resistant and either liquid or rubber-like, and are used in sealants, adhesives, lubricants, medicine, cooking utensils, and thermal and electrical insulation. Some common forms include silicone oil, silicone grease, silicone rubber, silicone resin, and silicone caulk. 1. PURE, FOOD GRADE: Made from high quality, Food Grade Silicone. 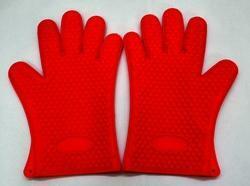 Our BBQ Gloves are heat resistant. Handle up to 230 centigrade with ease and confidence. These gloves will be essential part of your grill accessories. 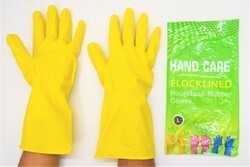 MULTIPLE USE: Use them as cooking gloves or oven gloves in your kitchen. Use them as grill gloves or BBQ gloves in your barbeque parties. Protect your hands while enjoying your occasions. You will enjoy them as the best grill accessory you ever had.